Average supermarket losses are 11.4% for fresh fruit, the report says. Forty percent of food in the United States is never eaten, amounting to $165 billion a year in waste, taking a toll on the country's water resources and significantly increasing greenhouse gas emissions, according to a report from the Natural Resources Defense Council released this week. The group says more than 20 pounds of food is wasted each month for each of 311 million Americans, amounting to $1,350 to $2,275 annually in waste for a family of four. Think of it as dumping 80 quarter-pound hamburger patties in the garbage each month, or chucking two dozen boxes of breakfast cereal into the trash bin rather than putting them in your pantry. The report points out waste in all areas of the U.S. food supply chain, from field to plate, from farms to warehouses, from buffets to school cafeterias. 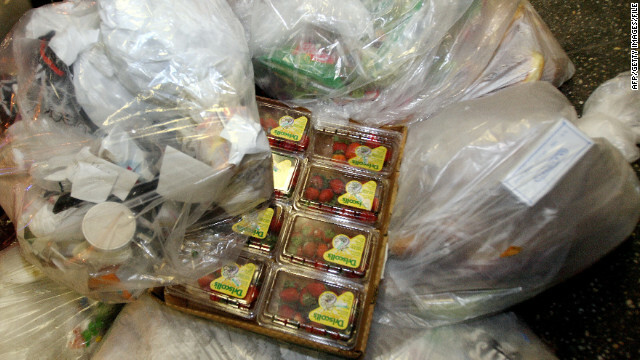 "Food is simply too good to waste," the report says. "Given all the resources demanded for food production, it is critical to make sure that the least amount possible is needlessly squandered on its journey to our plates." Most of the waste comes in the home, the report says. "American families throw out approximately 25% of the food and beverages they buy," the report says. It cites several reasons, including that food has been so cheap and plentiful in the United States that Americans don't value it properly. "Food represents a small portion of many Americans' budgets, making the financial cost of wasting food too low to outweigh the convenience of it," the report says. "This issue of wasted food is simply not on the radar of many Americans, even those who consider themselves environment- or cost-conscious." Enticed by impulse buys, sales and savings by buying in bulk, Americans simply buy more food than they can eat, the report says. Part of that problem comes from poor planning - such as impromptu decisions to eat out when there's still food in the fridge - and when we do cook at home, making enough to fill the plate rather than what we actually need to eat. The average size of the U.S. dinner plate is 36% bigger now than it was in 1960, the report says. Portion sizes account for significant food loss in restaurants, too, it says. Seventeen percent of the food in restaurant meals is not eaten, the report says, but too much food is served. "Today, portion sizes can be two to eight times larger than USDA or FDA standard serving sizes," the report says. And restaurants stock more food than they serve, it says. "Particularly wasteful are large buffets, which cannot reuse or even donate most of what is put out because of health code restrictions," the report says. Changes can be made in school cafeterias, too, according to the report. It encourages schools to serve lunch after recess so students would have more time to eat and therefore eat some of what they waste now. Retailers also bear some responsibility, the report says. "The retail model views waste as a part of doing business," it says, noting that stores may be looked at suspiciously by their corporate parents if their waste numbers are too low. "Industry executives and managers view appropriate waste as a sign that a store is meeting quality-control and full-shelf standards." Stores overstock displays of fresh produce to give an impression of bounty, leaving items at the bottom bruised and unsellable. They make too much ready-to-eat food. "One grocer estimated that his store threw away a full 50% of the rotisserie chickens that were prepared," the report said. They throw out food in damaged or outdated promotional packaging (think holiday cookies) that is still edible. Waste also occurs on the farm and in the packing house. "Approximately 7% of planted fields in the United States are typically not harvested each year," the report says. Among the possible reasons cited in the report: Growers can't get a good enough price for their crop to make harvest profitable, or they overplanted and have more crop than there is demand for, or the food is of edible quality but not marketable. "A packer of citrus, stone fruit, and grapes estimated that 20% to 50% of the produce he handles is unmarketable but perfectly edible," the report says. All that waste has environmental costs, the report says. Food production accounts for 80% of the country's fresh water consumption, but the waste of food means 25% of the fresh water is actually wasted. And wasted food rotting in landfills accounts for 25% of U.S. methane emissions. Methane is a greenhouse gas that remains in the atmosphere as long as 15 years and is 20 times more effective at trapping heat than carbon dioxide, according to the Environmental Protection Agency. The report says there are places to look for better examples on how to use our food resources. For example, American food waste is 10 times what is experienced in Southeast Asia. And we can also look to our own history. Waste is up 50% since the 1970s, the report says. One key recommendation of the report is standardization of date labels on food. Americans may be throwing out a substantial amount of edible food simply because they misinterpret a "sell by" date as a "use by" date, the report says. It also says the economic model of the food chain may need to change. "There is the plain economic truth that the more food consumers waste, the more those in the food industry are able to sell," the report says. If these problems can be fixed, the nation's hungry could benefit, according to the report. "Reducing losses by just 15% could feed more than 25 million Americans every year," the report says. The National Resources Defense Council is an environmental action group with more than 1.3 million members. It works to combat global warming, defend wildlife, create clean energy, cut pollution, protect waters supplies and revive the world's oceans, according to its website. ...and people wonder why everyone hates America. It's going to be fun watching the Earth puke humanity out of existence. It doesn't have to be this way, but most of you can't control yourselves. I feel bad for children, and the people who can. Unfortunately, most of you don't. If humanity is eliminated, you will be included and unable to watch it. I suppose you will have to get your fun in a way other than watching 6 billion people die. Yeah, this article is easily observed ijn the market or in ones own home. Tighten up and save a buck for better things...people eat to live not live to eat anyway. I've seen this problem first-hand, working for both deli and produce departments of major grocery store chains. The waste is terrible and sad to see. And it has environmental impacts on this nation and other industrialized countries which are going through the same problems. Why would it be impossible to take with you? I've come across more and more restaurants that have a "no leftovers" policy, often times saying it violates health codes. Whether that is actually true is another matter. I had to waste an entire half porterhouse at a restaurant in Indianapolis a few months back. It was huge, I didn't realize it'd be that big. So I figured, "I'll take the rest home and make steak fajitas with it tomorrow for dinner." Wrong! So now I carry a ziplock bag in my purse for those sorts of situations, I paid for it, it's coming home with me rather than the trash bin. In the full service restaurants just as for a couple of boxes. They will let you take your leftovers with you. Portions are so large anymore that sometimes we get an extra meal or two at home from the leftovers we take with us. Just leave your server a decent tip. We need the Star Trek replicator in production now! Then we just dial up our preferred meal in a "just in time" model. Removing the need for grocery stores. All we would need is huge stores of protein the could be resequenced into the choosen food. We have the ability to feed the entire world if we put our mind to it. I believe that World War II could have been avoided if we had fed the German people, but our ruling class and the German ruling class had other ideas in mind for expanding ltheir abor markets. It would do wonders for peace, but of course, profitability would "suffer". We can't have that now, can we? SO much food is wasted by people who don't need it, but eat it anyway. Overweight and obese waste most of the food they eat. USA is SO wasteful. All you can eat places encourage it. Too many snacks, fast foods, etc. It's a sin to waste food. Allah knows, and Allah will punish all of you for your gluttony. Who is this Alah? And why do you talk for her? I know I don't waste 25% of my food, my mom taught be better than that. I've worked in the restaurant and supermarket industries, and I've never seen anything remotely approaching these figures for waste. People get fired for such incompetence. Our family throws away very little because any leftover meats we give to the dogs and cats and any leftover produce and breads we give to our chickens, donkey or sheep. I do not even throw away a broccoli stalk. I chop it up for the chickens. Why don't stores and buffets let people pick up scraps for their pigs or rabbits or other animals? I am a vendor in grocery stores and I know that in the area where I live the grocery stores give most of their close dated items to the foodbank and local rescue mission. I also know of a pig farmer that goes down to the local bakery and produce warehouse daily for their outdated and bad produce and in return he gives them a huge discount on pork. Heaven forbid we give this food to the poor because if they got sick someone would sue. So we throw it all out instead. Lawyers are awesome. I really wish I could dig those strawberries out of the trash for my chickens. They would go nuts. The main culprits wasting food are big supermarket chains. Instead of reducing prices dramatically before expiration, they rather destroy it and toss it out in locked garbage bins so the poor don't touch it. i used to see the discounts on the perishable, but now i don't see it anymore. hardly anything discounted in the produces section and meats. putting high prices on items making hard for anyone to buy some vast stuff that can be canned or freeze well. The grocers in my area donate food to second harvest.... steaks, chicken, etc. They don't throw it away. They also discount items about to expire. I almost never pay full price for meat. Produce, yeah, some of it is going to go bad. That's just the name of the game. The BEST thing you can waste is the fast food you buy. Just pull up to their garbage can and drop that crud in. Drive off. You're better off not eating it. Better yet, cook your own meals. I used to feel guilty about the abundance in the grocery stores. Now, I am grateful. Gratefu to the farmers, their employees, the transportation and storage systems that make this variety and abundance possible and to my local grocery store employees who place it on the shelves. Shoot.....if you had been married to my 2nd ex-wife...40% wouls be a low guess. The slop she served up were the worst vittels of any of my 5 ex's fixed. That's why I'm a chuck-wagon-cook. Free & da eatin' is good. Plus..I gots da cattle to keeps me company..& better lovin' than anyy of my ex-heffer's gace me. Mooooooo is all I can say...that..& "Come 'n 'get it...Soups On!"